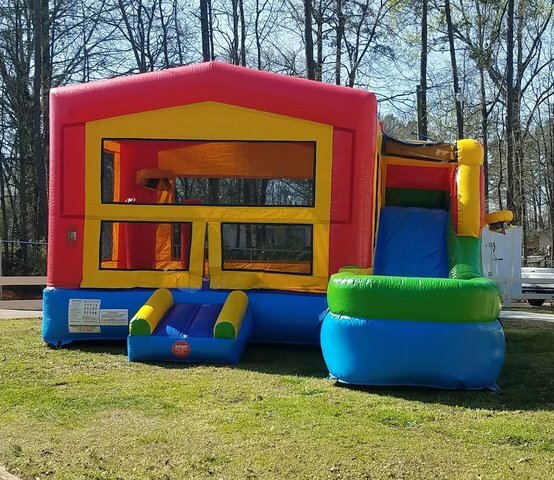 Camerons Combo is an amazing unit equipped with an 12' slide, jumpy area, kicking bags and two basketball hoops in the jumpy area. The combo unit has a vented see through window so the kids can stay cool while the parents are able to keep an eye on the activities inside. Also for safety there is an inflatable entrance and exit ramp. The unit requires a flat surface for installation as well as a power source within 100ft . Cameron's Combo can be used as a dry or a wet slide. Please indicate in notes when you check out if you want it to be a wet slide. The garden hose attaches at the top of the slide for a great time.